WHAT'S GOING ON? : This 60-second advert has been showing on television for a few weeks now, in which time there will have been plenty of opportunity for viewers to have a really close look. Is that really a man dancing, or is it all done by computer? Have they somehow manipulated the original film? Or have they really gone to the trouble of rebuilding a set in exacting detail? In which case, how does the dancer look so much like Gene Kelly in some ways (ie his face and clothes), but so unlike him in others (ie the frankly unsettling way his arms and legs seem to bend as if he is actually made of rubber)? The simple answer to whether the advert is computer trickery or an elaborate reconstruction is that it's a bit of both. But yes, the producers did go to the trouble of building an exact replica set, and yes, it is a real human dancing. The set for this advert was built at Shepperton Studios, complete with practically everything that would have been there at the filming of the 1952 classic film, including fake cobbles, fire hydrants, shopfronts, lamp-posts, and of course rain (60 gallons of water per second). Richard Chambers, of advertising agency DDB who produced the advert, says much study went into making the set as authentic as possible. "We've tried to match the look and feel of everything - from the buildings to the scale and layout, the lighting, the wardrobe, the rain. Even some of the equipment on the set is the similar to what would have been used when the film was made in the early 1950s." The set took 22 people 14 days to build, with the aim of reminding viewers all the way through of the original, while they would realise it was a "completely modern piece of film". But once it was created, the task was to find dancers who could do sufficiently modern moves. David Elsewhere, also known as David Bernal, earned a degree of notoriety on the internet when a video of him dancing at Kollaboration, an Asian American arts festival, was e-mailed by thousands of people around the world. His bendy moves, which could easily be mistaken for Invincibles-style rubber joints, almost defy belief. But they are the physical dance moves - along with those of two other dancers - you are looking at in the VW advert. Elsewhere told Ad Breakdown that he was contacted out of the blue by an e-mail from the production company, who invited him to London for filming. When he arrived, he and the other dancers were shown Gene Kelly's original routine "about a million times" before they started dancing. "I was quite familiar with his movements, but when I actually tried to do it myself I realised it was pretty hard to dance like Kelly. It's definitely an honour to be in this ad though - it's almost like they are implying that my dancing is like a more modern version of Kelly's skill, and of course that's flattering for a dancer," he said. Elsewhere, 25, who lives in California and now dances for a living, says the only parts of him that are double-jointed are his thumbs - his dancing abilities are purely down to flexibility and practice, he says. But although the set is real and the dancing is real, there is a huge amount of computer wizardry in the advert. For while the three dancers are dressed like Kelly (including padding), and all wore prosthetics to make their heads shaped like Kelly's, the face you see is actually Kelly's. 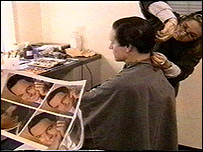 Images of Kelly, who died in 1996, were taken from the original film and superimposed on the pictures of the new dancers. 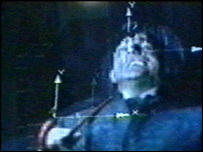 To make this possible, the production team had to follow the original's camera moves, positions, heights and lighting so that the Kelly face would match up satisfactorily. "The process of putting bodies and heads together and things just throws up little issues - small things like lighting or continuity needs to be altered in order to make everything as closely as possible and make it fit," says Chambers. VW hopes its ad will be one of those people want to watch again and again, and many websites discussing it talk with awe of its workmanship. But film critic David Thomson, of the Independent on Sunday, does not approve. He wrote that "our collective memory, our culture, our pleasure have all been monkeyed with... its beauty and its integrity are being flagrantly interfered with... the nature of a movie is being insidiously mocked and exploited". VW's reasons for using this are clear - they equate the iconic status of Singin' in the Rain with that of the Golf, and by reinventing Gene Kelly's steps, they hope people will think of the new Golf as warmly as they did of the old. Sales have not set the world alight, though they have improved since the car's launch, and the GTI has had favourable reviews. For VW, much is riding on the Golf finding the status it once had. But doing that takes more than a bit of fancy dancing. Ad Breakdown is compiled by Giles Wilson. By linking the car to the film, VW are trying to suggest their product is, by association, a classic. And arguably it is, for certainly it has stood the test of time. However, they are clearly pitching at a certain demographic for whom the film would have been a "must see" many years ago to achieve the subliminal link. I can't imagine the "MTV generation" reading too much into it other than, of course, that it is a fine example of advertising being within the modern day entertainment industry as much as the retail. I personally think the advert is more a testament to the agency and creative talents that developed it, rather than a good selling tool for VW. And as far as the IoS critic's opinion of the advert is concerned, I think he's far more interested in his own pomposity to appreciate the genuine quality of the delivered message. The faithful reproduction of the SITR set alone suggests the tone was one of reverence and homage, not "insidious mocking and exploitation." An awful advert. The dancing looks freaky and abnormal, Gene Kelly's face is put on the body at wrong angles (he appears to have half his face missing) and the music is scratchy and irritating. Kelly's estate should be ashamed of themselves for allowing this. What they've done is take a well-regarded classic and updated it to make it frustrating and annoying while sullying the memory of the original. Is that really the message the ad company wanted to get across? I read about this ad a while ago and popped off to a site to d/l it and see what all the fuss was about....and to be honest i can take it or leave it. OK technically it is very good, although some of the mapping does look a bit ropey at times. But it left me cold. Now show me the Morecambe and Wise parody of singing in the rain....thats good! I find the entire advert offensive, once again classic things from our past have been tampered with to please the design muses of yet another corporation, Gene Kelly must be spinning in his grave, nothing is sacred anymore. It falls into the same catagory as the rubbish remakes we have to suffer because the American film industry has ran out of ideas. What is David Thomson on about? This advert is a milestone of our times where current technology and skill married with a historic moment in film have created something new and interesting while surely sparking interest in not just the car, but the film as well. If he doesn't like this piece of art, then try something else. I don't believe Gene Kelly would have been anything but flattered by this level of attention. I was fascinated by the ad when I saw it. A very clever bit of film. I then dug out my copy of 'Singin'in the rain' and watched that. The original is better. My only problem with the ad is that some of the dance moved I associate with Michael Jackson. There is so much to dislike about this advert where do I begin? Firstly, no-one should try to update a classic as the original will always be best. The Gene Kelly routine has charm and naivety the update is nasty and knowing. My children find the advert creepy and no wonder, the men in the masks look more like Freddie Kruger than Gene Kelly. I can only assume that the subliminal message is that the new car is a poor, clunky, robotic facsimile of a much-loved original. The ad-makers will think they¿ve succeeded by creating an ad people are talking about - but we're all talking about how queasy it makes us feel. I'm probably part of the target market and I enjoyed the ad, as did a lot of my friends in their mid-20s. Not prone to over-analysis, we just laughed out loud at the ad, thought the dancing was fun and the music funky. I'm not old enough to remember the film first time round, so maybe it not surprising that the ad didn't rile me as much as it did some older folks :) In case people accuse me of not appreciating the classics, I should like to add that I went out and bought a fifteen-year-old Golf GTi two weeks after seeing the ad. I can't believe how negative everyone is being on here with regards to this fantastic advert. Gene Kelly might spin in his grave over this advert but it wouldn't be out of anger. If anything Gene Kelly approved of new dance moves and experimenting. I think he would be dancing in his grave just as I dance every time I see this advert. It is lovely to see Gene back on the screens proclaiming "I've got a smile on my face" and it just so happens to be a car advert, which is insignificant but a handy medium in which an old time favourite is immortalised. I look forward to getting my hands on the remix I think Kelly had a beautiful voice. And as you can see I'm only 22 which just shows that you can never be too young to appreciate classic films or artists. Can you dance like that? No? Well, be quiet then. I've seen the advert once and loved it, I was mesmerised! And Singin' in the Rain is one of my favourite films. I think Mr Kelly would be very happy to see one of his most iconic scenes so artfully updated. Aw c'mon whats all the fuss about. I know it's rainging outside but cheer up you lot. It is a funky ad and I like it alot. When I first saw it I thought why on earth are they showing this old thing, but soon had "a smile on my face". Stop living for yesterday and look forward to tomorrow. I think the advert (and Elsewhere's dancing skills) are fantastic. If Gene Kelly were still around, I'm sure he'd have approved this tribute to a classic movie. I only hope that Mint Royale, who remixed the music, change their minds and release the song as a single. The most brilliant, amusing, entertaining advert I have ever seen. A real piece of theatre. I hope it brings a new audience and a new interest in dance and creativity. I'm afraid I really dislike this advert. I've seen it about 6 times, and until seeing your piece here, I couldn't have told you it was for the Golf. Seems more like a medium to show how clever the agency is than to advertise the car.